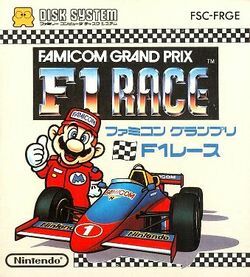 Famicom Grand Prix F1 Race is a racing game developed by Nintendo for the Family Computer Disk System. It was released in special blue-colored Disk Cards, which supported Nintendo's Disk Fax peripheral, allowing players to send their time trial scores to Nintendo for the chance to win prizes. It is a top-down racing game where the player controls a Formula 1 car. The player can either choose to play alone, or with other cars. The cars have a certain amount of health, tire life and fuel, which can decrease if the player crashes into a wall, crashes into another car, or drives off the road. Health, tires and fuel can be regenerated if the player takes a pit-stop, but doing so takes away racing time. Winning races during the Grand Prix mode will award the player with money, which can be used to buy new cars. This game was part of a large contest organized by Nintendo in Japan. The winning prize of the F-1 Grand Prix Tournament was a yellow version of the Super Mario Game & Watch and the game's documentation mentions that only 10,000 copies are supposed to exist. The contest was opened from October 30, 1987 to December 15, 1987. The winning prize came in a special box with instructions and a Disk Fax letter addressed to the lucky winner. The game itself came in a yellow plastic case in the shape of Diskun, the official Nintendo's DiskCard mascot at the time. Along with the traditional Disk Writers, Nintendo also manufactured machines called Disk Faxes (for use with blue disks). These machines could upload the data directly from the disk card (score, player's name etc...) and send all this information, via modem, to Nintendo's headquarters. As a reward for submitting your information to Nintendo through the Disk Fax machine, several lucky players were given a limited special edition version of the Super Mario Bros. Game & Watch. While the original version was manufactured in the New Widescreen Game & Watch format with a light blue casing, this version was colored yellow, with a unique control layout not used by any other Game & Watch. Accompanying the prize was a license that Nintendo printed out with the player's information and ranking. This page was last edited on 17 November 2013, at 01:15.